Comparative Chart of St. John's River Florida. An unusual and attractive coastal map produced by the U.S. Coast Survey to chart changes in the St. Johns River (FL) delta between 1853 and 1857. Details a number of sandbars and shoals and records their appearance and disappearance at various different dates. A profile chart in the upper right quadrant details changes to the shipping lanes that occurred between the first survey of the region in 1853 and the final survey in 1857. They Hydrography for this chart was accomplished in 1853 by a party under the command of T. A. Craven and again in 1857 by a party under the command of S. D. Trenchard. 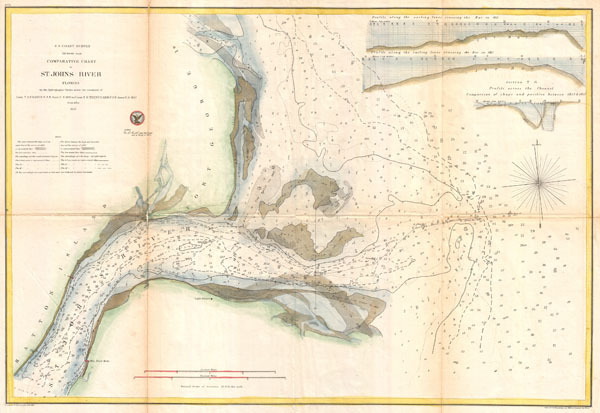 Compiled under the direction of A. D. Bache, Superintendent of the Survey of the Coast of the United States and one of the most influential American cartographers of the 19th century.